The unrest in a tribal village of Caurem over ‘illegal’ mining may see some ray of hope to resolve the issue as Chief Minister Laxmikant Parsekar will meet the protesting villagers on Tuesday. Parsekar confirmed while talking to goanews.com that he is meeting them on Tuesday. Prakash Velip, the tribal leader and BJP vice president, today met the CM and sought his intervention to resolve the issue amicably. The protesting villagers were arrested thrice since 21st March by the police while their leader Ravindra Velip, a local panch, was blind-folded and thrashed in a judicial lock-up. The crime they have committed is to stop the transport of e-auctioned ore, alleging that more than double quantity of ore has been transported illegally. 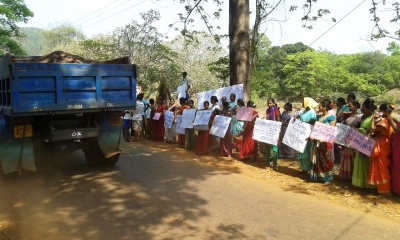 While supporting the mining activity, the local tribals have been demanding inventory of the ore lying at three mining leases in their village which would add more revenue to the state treasury. They have also formed Sadhana Multipurpose Co-operative Society to run mining-related activities in the village, so that the locals also benefit from the mining activity. However, the government is simply refusing to register the co-operative society, demanding deletion of the word ‘mining’. On the contrary, the mining transport was started with police protection, neglecting their demands. “Let me see what their demands are. I will decide accordingly”, Parsekar told goanews.com. Velip, who has intervened for an amicable solution on the issue, however seemed hopeful of a positive solution through which the locals would benefit from the mining activity.